Hamilton after been unable to match the pace of Nico Rosberg all weekend to fought back to stay third, a well-timed pit-stop enabled him to leapfrog Ferrari’s Kimi Raikkonen in the closing stages. 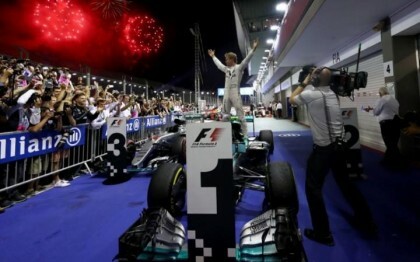 Fox Sports reports Rosberg’s third win in a row, his first in Singapore and the 22nd of his career, while Hamilton had to settle for third behind Australia’s Ricciardo in a tactical night race on the Marina Bay street circuit. 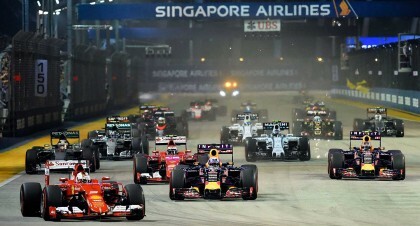 Nico held on in a tense last lap to take the chequered flag 0.4 seconds ahead of Ricciardo. He moves to 273 points, eight ahead of Hamilton, with the Malaysian Grand Prix next up in two weeks. 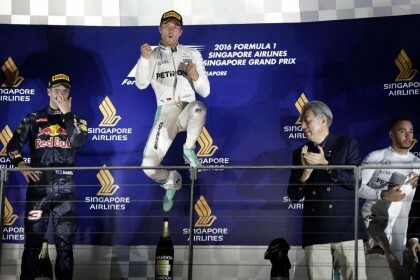 Rosberg would have followed Ricciardo in but after a lap caught in traffic Mercedes opted for Rosberg to remain the tortoise to Ricciardo’s hare – a decision which was vindicated at the chequered flag by precisely 0.488 seconds. “It was so close at the end, how it should be in Formula 1,” Mercedes boss Toto Wolff told Sky F1. “Four really great cars, different strategies and I must take my hat off to Red Bull with strategy by pitting him, we couldn’t do that.” Sky Sports report.